The Romero family was on its way back to Mission Viejo. They had been camping ten miles south of the U.S. Border in Rosarito Beach, and their camper truck was finally heading north for the two-hour drive home. The family crossed the border into California in the late afternoon with the hot sun hanging low over the Pacific. They passed Sea World’s Sky Tower; drove the long, lonely stretch of highway through Camp Pendelton; and passed the San Onofre nuclear power station with its blinking red beacons. “Me and my sister rode in the camper,” James Romero told me of that trip he took when he was 13. “I slept most of the way home.” What little ventilation they got was the warm wind blowing in through the shell’s windows. They arrived home early in the evening. It was late August of 1985, and Southern California was a few days deep in a scorching heat wave. It was also six weeks deep in a terrifying crime wave. But James was, after all, barely a teen and enjoying the heart of his summer break from La Paz Intermediate School. He had a new girlfriend, plenty of friends in the neighborhood, and an Atari console. He didn’t watch the news. He didn’t know about the killer. Just that morning the Orange County edition of the Los Angeles Times had run a somber front-page headline: “Slaying of S.F. Man Linked to Valley Intruder.” Without revealing details, Los Angeles County Sheriff Sherman R. Block revealed that forensic evidence had linked the murder of Peter and Barbara Pan in the Lakeside District of San Francisco to the same killer who had already murdered more than ten people in the L.A. area. Peter and Barbara Pan were found by their son the previous Sunday morning. Both had been shot with a small-caliber gun. The assailant had entered through an unlocked second floor window. Peter, 69, was executed in his sleep with a single bullet to the temple. Barbara, 62, had survived her sexual assault and a gunshot to her head. She was recovering in San Francisco General Hospital. 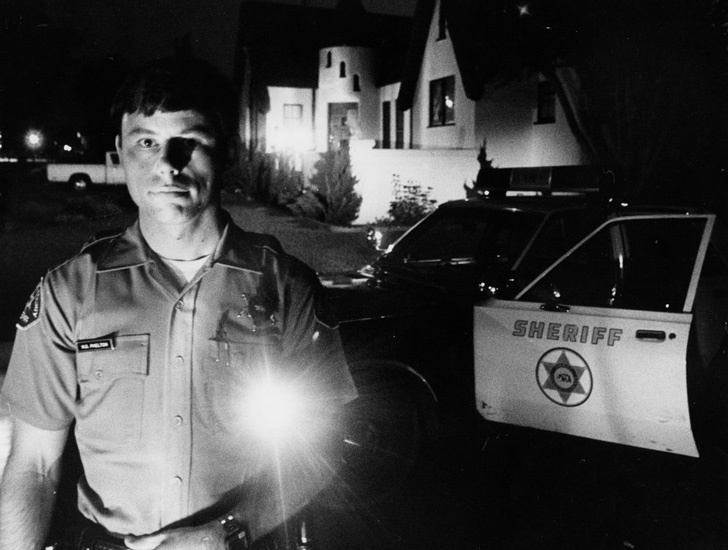 A sheriff’s deputy on patrol at night in Temple City, where attacks by the Night Stalker caused rising fear in the community. Behind him, homes are visible, with their porch lights turned on for safety. The Intruder’s known attacks had started on March 17th with a pair of strange and brazen murders in the west San Gabriel Valley. First, 34-year-old Dayle Okazaki was shot to death in the kitchen of her Rosemead condominium. Okazaki’s roommate, Maria Hernandez, survived an encounter with the same assailant when he came upon her in the garage the roommates shared. He fired a shot at her, but it was deflected by the set of keys she’d reflexively held up in front of her face. 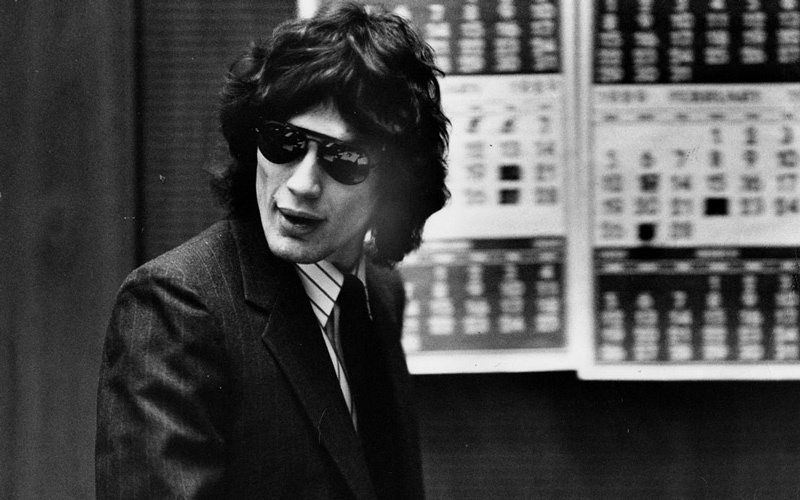 Thinking he’d killed her, the assailant entered the house and shot Okazaki in the head. An hour later, about three miles away, a man approached a car idling at a stoplight in Monterey Park. The man shot the driver, 30-year-old Veronica Yu, to death with a gun that would later be matched to the Okazaki murder. He drove away in a stolen Toyota. Over the next five months the Intruder claimed random victims in Whittier, Monrovia, Burbank, and communities scattered all over L.A. County. More than a dozen of his victims were dead and most of the killings involved sexual assault and burglary. He strangled. He shot. He hacked with a machete. He bludgeoned and slit throats. Among those who survived were 16-year-old Whitney Bennett, who was beaten with a tire iron and choked with a telephone cord, and 27-year-old Virginia Peterson, who was shot in the face with a .25 caliber pistol. When it came to the details, it was difficult to know what was the killer’s MO and what was mere coincidence. He struck in the early morning hours, usually near freeway off-ramps. He often struck houses painted yellow. He spoke of Satan and sometimes drew pentagrams at the murder scenes, on the walls or on the bodies he left behind. As media coverage of the murders gained momentum, gun sales soared—so did summer temperatures. In an era before ACs were commonplace, people locked windows and tried to sleep in the stultifying heat. Demand for deadbolts and window bars spiked. The Humane Society reported an unusual run of large dog adoptions. It was too hot to sleep that night, and James had dozed most of the drive back from Mexico. He played Atari with his sister for a while and talked on the phone with some friends. After midnight he was still awake. Everyone in the house was asleep when he slipped out to the truck to get the pillow he’d left in the camper shell. The truck was locked. The Romero house on Via Zaragosa had no side gate, so anyone could walk from the driveway around to the backyard along a gravel path. Anyone and anything. The house was built at the base of a steep hill, which created a narrow green-belt between Via Zaragosa and the parallel street higher up. “We had ’possums and coyotes back there,” James remembers. “Basically, there were animals there all the time.” So when he heard a rustling back there in the dark, that’s what he assumed it to be. He went back to investigate, his footsteps crunching along the gravel path. Then he stood in the middle of the dark back yard in the balmy August night. “I kind of looked up on the hill, and I was like, ‘Oh, it’s probably a dog or a cat or a possum.’” Whatever had made the noise, he didn’t see it. James didn’t look behind him in the shadow of the house, though. He didn’t look by the glass door that led to his parents’ bedroom. He figured that whatever animal had wandered into the yard had bolted when it heard him approaching. James went back along the side yard and into the garage through the side door. He switched on the light and started working on his mini bike in the front corner of the garage. It was then, crouched by his bike, that James heard the footsteps coming down along the gravel path from the backyard. They came to the top of the side yard and stopped. Romero held his breath. This was no animal, and the only thing between him and the person outside was the ventilation grate in the garage wall. Whoever was standing on the other side of the wall was looking for him. Whoever it was had been in been the backyard watching James from the shadows. Whoever it was had waited and then followed James around the side of the house to see where he had gone. Seeing the street empty, he would know James was here in the lit garage. The unlocked side door had a glass pane in the top half. Whoever was outside could easily see in—but James couldn’t see out. He ducked behind the family car. James bolted back through the garage and out through the side door. From the edge of the garage, where the prowler’s footsteps had paused, James saw a tall, stooped stranger, dressed mostly in black, ambling towards an Orange Toyota hatchback with a chrome roof rack. “The car was facing down the hill,” James remembers. “Instead of driving straight down, he made a U-turn—and I’m out in the street, and he drives right past me.” The man in the car turned his head to glare at James as he sped off, turning left at the corner and heading out to the main road. It didn’t take long for an Orange County Sheriff’s cruiser to pull up at the Romero house. As far as everyone was concerned, the whole thing was a routine prowler call. “They come and take the report. I hand them the piece of paper I wrote the license plate down on, and they go, ‘Okay, thanks a lot. Good night.’” The commotion over, the Romero family all went to bed. 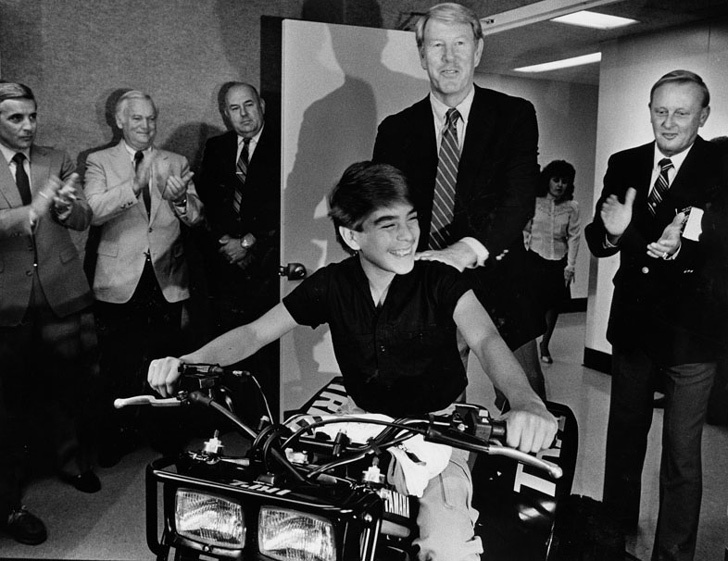 Though no one would know it for almost a week, 13-year-old James had just faced down the Night Stalker and lived to tell about it. “The next thing you know,” James recalls, “people are knocking on our door at 6 a.m.—investigators and police in plain clothes, and they have a camera, and they want to know everything from start to finish.” James ran them through all that had happened the night before, though he still wasn’t sure why this prowler report had brought so many cars to the street outside. One of the detectives told James’s parents that they needed to take him somewhere for a few minutes. “I was a little freaked out,” James says. “I didn’t know what was going on, and my parents weren’t there.” They drove James to a motel in Lake Forest, just off the 5 freeway. They wanted him to look at a car in the parking lot. “They were kind of coaching me beforehand,” James says. “‘We’re just going to drive though the parking lot. If you see a car that looks like the one last night, let us know.’” They drove James past the car twice without stopping. It looked a little like the one the prowler drove, but it was the wrong make and had a different license plate, and it didn’t have the same chrome roof rack. Then James led the investigators around to the back of the house and showed them where the prowler must have been standing by the sliding glass door to his parents’ room. When he took them over to the door, he noticed something peculiar. A dead bird lay on the concrete just at the base of the door where the prowler must have been standing. Later that morning investigators asked permission to take James to look at another car. “So they took me away from my parents again, and we go to Newport Beach. We drive through a neighborhood. Same thing: ‘We’re not going to stop. We’re just going to keep going.’” That car, too wasn’t a match. It wasn’t the same color, and again the license plate wasn’t what James remembered. It was also on the news that James and his family learned where their prowler went after James flushed him out. He drove a mile and a half away to a home on Chrisanta Drive. There, he slipped through an unlocked rear window and found Bill Cairns and Inez Erickson sleeping. He shot Cairns three times in the head (Cairns miraculously survived) and raped Erickson. Throughout the attack the perpetrator forced Erickson to repeat the words, “I love Satan.” During the ordeal, the assailant paused and asked Erickson if she knew who he was. She didn’t. “I’m the Night Stalker,” he told her. That night, the shaken Romero family followed the news together. James saw the old sketch that had been on the news for weeks. Then, on a later broadcast, he saw a difference. 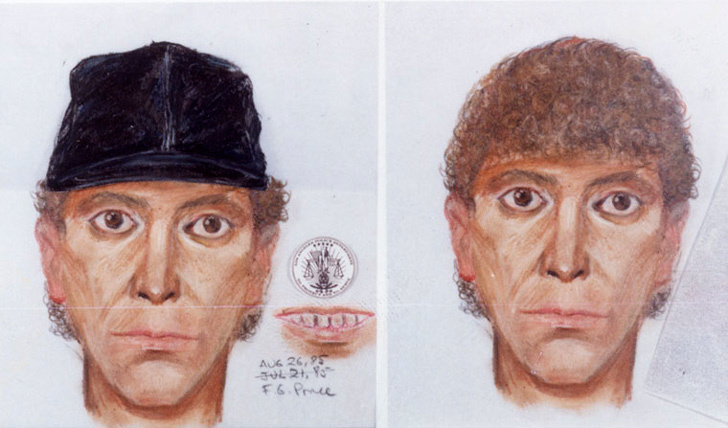 “All of a sudden on the night news they sketched in a baseball cap, and that was pretty wild.” At that point the significance of James’s prowler encounter hit home. Wednesday morning, L.A. County Sheriff Sherman Block told reporters that deputies “will be stopping cars in the late night and early morning hours” if the car looked anything like the one James described. But in fact the killer’s car had already been found. In the pre-dawn hours on Tuesday, the owner of a business in a Rampart-area strip mall called in a car abandoned in his parking lot. 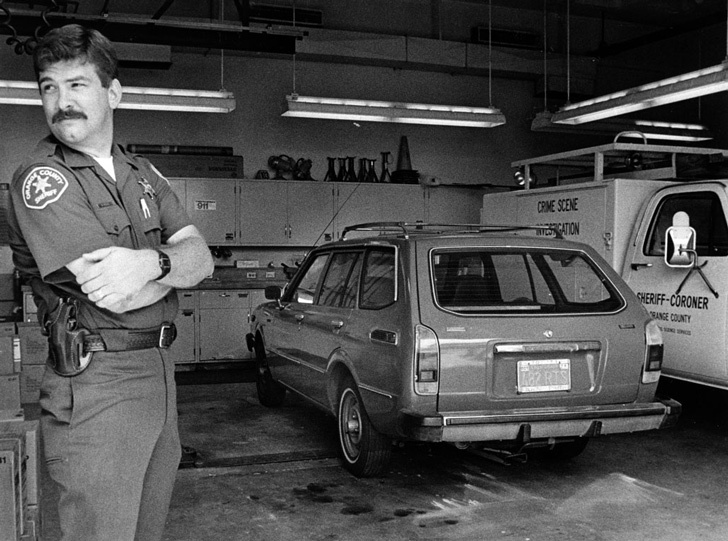 It was an Orange Toyota station wagon, and the license plate was a close match the partial number James had reported. Authorities pretended the car was still undiscovered and staked it out, hoping the killer might return. After nearly a day of fruitless round-the-clock surveillance, the car was hoisted onto a flatbed tow truck and taken in for forensic testing. The killer had thoroughly wiped down the car to rid it of his fingerprints, but Orange County technicians tried a new method, developed in Tokyo, that allowed technicians to fix otherwise invisible prints with Superglue fumes. A patient technician at the Sheriff’s Department lab was able to find single, readable print on the back of the Toyota’s rearview mirror. By that time, the car’s owner had been identified, and his own prints excluded. This unidentified print likely belonged to the Night Stalker. The Sheriff’s department fed that single print into their computerized fingerprint file. 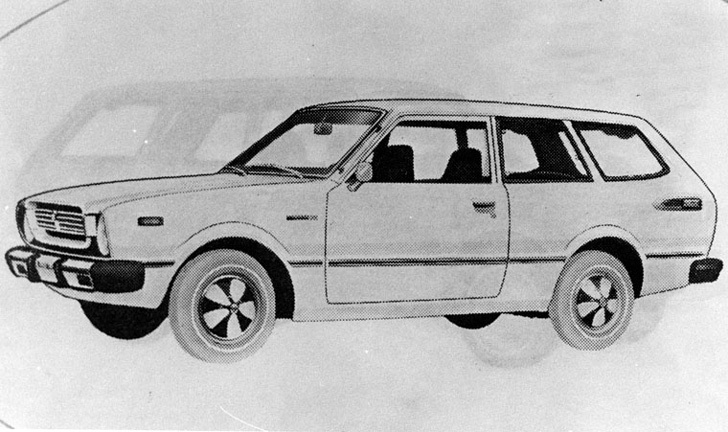 They came up with 100 prints in the database that were similar to the one found in the Toyota. It took hours of tedious, painstaking comparisons to exclude the extraneous 99 matches, but by late Friday a conclusive match was made. 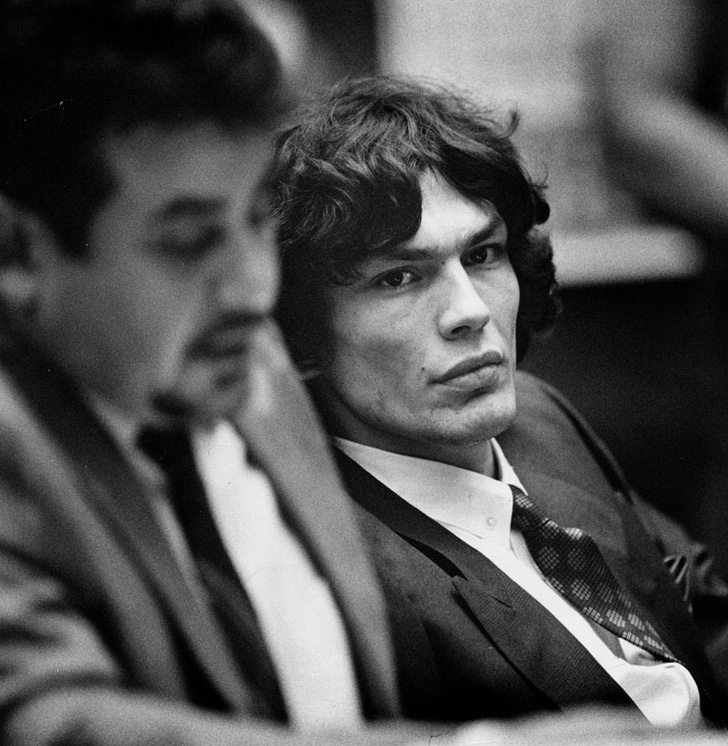 The driver of the Orange Toyota was a 25-year-old drifter by the name of Richard Ramirez. Once the killer had been identified, authorities weighed their options. If they revealed his identity to the public, he’d go into hiding. If they didn’t, he might strike again before they tracked him down. The risk authorities took paid off. Ramirez had tried to visit his brother in Arizona, and he had spent much of Friday on busses and trying to get ahold of his brother from the Greyhound terminal pay phone in Tucson. He hadn’t seen the evening papers, where his mug shot for a car theft in 1984 was on every front page. He hadn’t seen the news, where his identity was the lead story. 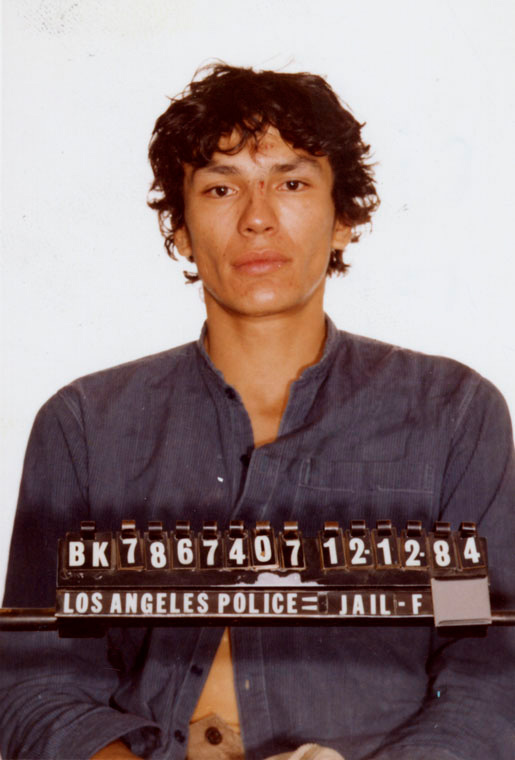 He caught a bus back to East L.A. and disembarked, a little before 8 a.m. Saturday morning, into a city where millions were on the lookout for him. “That’s when he got off a bus and didn’t know his real identity was out,” James says. “He sees his picture in a store and then tries to steal a car from a lady.” Discovering his identity was out, Ramirez, tried to steal a car on East Hubbard Street. Neighbors, thinking Ramirez was a mere carjacker, chased him, beat him down and kept him until the police arrived. The next week James sensed something was up. “I had long hair at the time,” he remembers, “and my mom said, ‘Hey, James would you cut your hair? Look a little more presentable?’” He was at the barber shop when a phone call came for him. The caller, a police officer, chatted with him about ATC three-wheelers. It didn’t take a detective to know something was up. When he showed up to a televised press conference, James was hailed as a hero and showered with plaques and awards. He got checks from various city groups and box-seat tickets to some Rams games. At the press conference finale, James was presented with a brand new Yamaha ATC. The two of them, strangers linked by incomprehensible tragedy, watched as a group of tall men were lined up on the other side of a one-way mirror. “It was scary,” James admits, “but I felt obviously protected. He was in custody, and he couldn’t even see me.” James knew Ramirez right away when the the stooped, gaunt man shambled into the room. “A few details that really stood out was how he walked and his height and just his silhouette.” Both witnesses identified Ramirez. But that moment—with a reflective Plexiglas window between them and a room full of police officers—was nothing like the breathless, haunting memory of the killer glaring at James from the passing Toyota. It would be a few more years before the two again came face to face. At the preliminary hearing, James, by then 17, was called as a witness. The defense seemed intent on intimidating the teenager. First, though legal maneuvering, they had James’ father and sister, who had come along for moral support, removed from the courtroom as possible witnesses. The judge allowed James’s mother to remain. Ramirez died of lymphoma in 2013. These days James Romero, a handsome, trim man in his early-40s, lives in Phoenix, kept busy with a family of five—including a set of young triplets. But he still often thinks of that hot August night more than 30 years ago. Paul Buchanan is a professor of English at Biola University. His most recent book is Tricks Every Boy Can Do.